Roger Wingate previews ERTL's battle droid with STAP. Molding Quality: 9 - Did ERTL do this? Or did they subcontract Tamiya? Detail: 9 - Sharp and plentiful. Could this really be an ERTL kit? Accuracy: 9 - Looks like they got everything right. Instructions: 9 - These actually look to be useful. Clear and logical. Overall Rating: 10 - Well worth the $19.50 retail price. 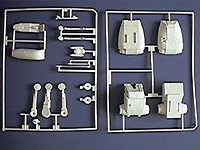 I just got a hold of the two new Star Wars®: Episode I kits from AMT/Ertl. If you haven't seen them yet, RUN out and get them! The Federation Droid with STAP is a nice big kit. The droid by itself stands 12" tall, and assuming the height of the "real" droid is eight feet, that works out to that they were going for 1/8 scale. 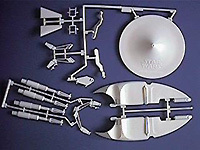 There are actually two kits in the box: the Droid and the STAP, each with about forty parts. The best news of all is that the droid model is almost fully posable when complete and can be made as a stand alone figure with a minor amount of work. Both the droid and the STAP are crisply molded with no flash. 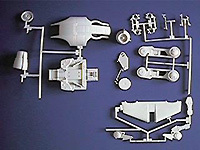 Parts are well detailed and appear (from test fitting) to go together with a minimum of fuss. There is one small drawback though. There are several sink holes that would be very hard to fill. One example is on the small piece that holds the foot pedal to the STAP. All four of the pieces in my kit had sink holes. Fortunately they were small and will not show up much when the model is completed. Other than that I must say that this kit is the absolute best plastic sci-fi kit AMT has ever produced! These kits are available from hobby shops and major toy discount shops (ToysRUs, KayBee, etc.) throughout the US and Canada, as well as internet mail order shops like Q's Continnuum and Link and Pin Hobbies.